Happy Easter to all our pupils, parents and staff! Reminder: Photos/videos are not to be copied or used in any way. Lots of creative and interesting hats to be be seen during our parade! Well done to everyone who took part. Thanks to Pamela Owens and the teachers who took photos. More photos here. Mr. Kelliher's First Class were busy measuring lengths of items and the capacity of containers. Lunch time Mini Leagues have commenced for boys and girls. Thanks to our senior pupils who set up the pitches, mentor teams and referee. Thanks also to the teachers volunteering to supervise at lunch time. Well done to the girls in 5th and 6th who played in the Spar 5s soccer blitz this week. Great determination! Thanks to the teachers who have trained with them on Mondays and to the parents who helped with transport. A huge thanks to our Parents' Association for all their hard work. The Bake Sale raised over €1,000 for school funds! Thanks to all those who baked and bought items. Ms. Walsh's 6th class using their maths skills as they design a room. 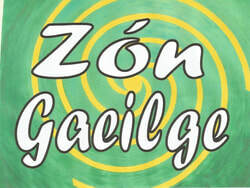 Bhí an-spóirt againn ag an gceolchoirm! Ceol binn, amhráín agus damhsa. Congratulations to all the 6th class children who received the sacrament of Confirmation on Wednesday 13th! Thanks to their teachers, Ms. Walsh and Mr. Garvey and Colette and Angela. Engineers visited classes during Engineer's Week. Mr. Masterson's 5th class enjoyed their activities. Congratulations to Mrs. Galvin who organised the Fairtrade baking and art competition in Áras Chrónáin! Well done to the pupils who interviewed the farmers, sang a Fairtrade song and won prizes! Clonburris NS registered for its first Active School Flag (ASF). It involves lots of work for staff and pupils and will also involve parents and members of the community. Well done to 6th class pupils who are playground leaders on the Junior and Senior Infant yards. Ms. Morley and Mr. Murray collected our Playground Leader bibs. Lots of volunteers for our staff ASF committee at our meeting. Please read the school newsletter. It has lots of information and upcoming events are listed. It was very hard for the judges to pick winners this year! So many wonderful hats! Here are our winners. The rest of the raffle winners can be seen here. 5th classes are participating in the Cycle Right programme. They're learning how to cycle safely. Valuable life skills! Ms. O'Brien's 4th class were using percussion instruments and their voices to create theme tunes for news programmes. Very creative pupils! Some of the pupils who visited Newlands Garden Centre. They made lovely Spring baskets and saw animals, fish etc. Thanks to Mr. Toomey and the SNA's who accompanied the group. Our Book Fair started on the 2nd of April. Lots of new books to read! Thanks to Mrs. Duffy and the Parents' Association for all their help. Lots of activities are taking place each week in our school as we continue to work towards achieving our first Active Flag. Ms. Tormey's 5th class are doing the 'Find Your Inspiration' programme at the moment. Please use the school journal or phone to make an appointment to see your child's teacher. School tracksuits are for P.E. days only. We are a healthy eating school. We celebrated WDSD19 in school. Ms. O'Brien's class used Lámh to sign the lyrics to 'How long will I love you?'. Ms. Walsh's 6th class are busy finishing their Junior Entrepreneur Programme projects at the moment. They've worked really hard on them. Thanks to Ms. Walsh and Angela for giving advice and help. More photos here. Second classes celebrated the sacrament of Penance. Thanks to Mrs. Galvin, Ms. Donlon and Ms. Maher, the SNA's working with the children and to Fr. Damien, Fr. Shán and Fr. Kevin. NEW COURSES AVAILABLE THIS JANUARY! Parents: a number of pupils in Clonburris have severe nut, egg and kiwi allergies. PLEASE do not include any food containing these items (including cereal bars etc.) in your child's lunch. Parents: Book/Savings Club available in the school. 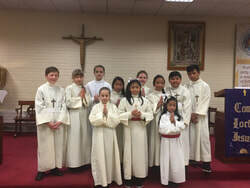 New altar servers needed. Click here for further details. School closes on April 12th @ 12 p.m.